Get ready to rest easy on the elegant and sumptuous Gazzoni Teak Sectional Outdoor Ottoman. 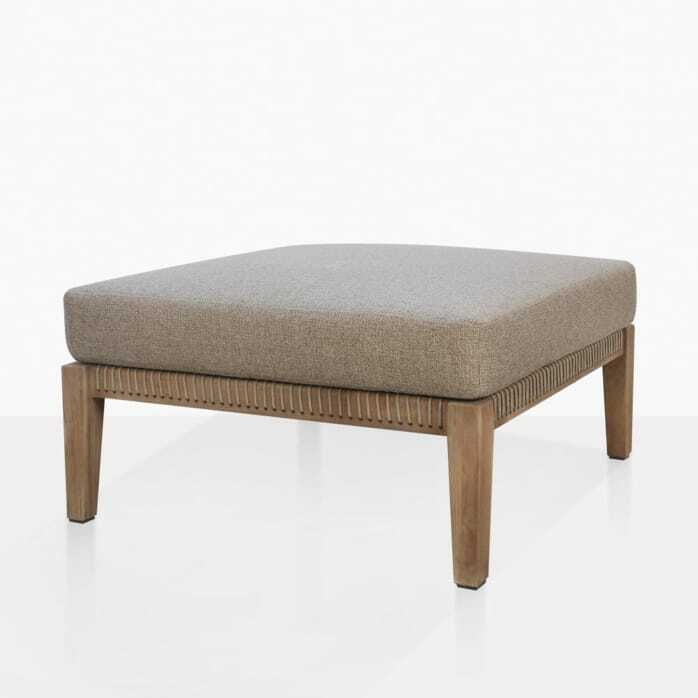 Allowing you to put your feet up, sit on a charming lower seat, or use as an additional tabletop, the Gazzoni Teak Ottoman is a chic and necessary item for assisting you in ultimate tranquility. As part of the incredible Gazzoni Teak Sectional Collection, this Ottoman can be purchased to compliment and complete your Gazzoni look, be placed on its own as a simple and stylish addition to your area, or mix and match with other collections for a more eclectic feel! 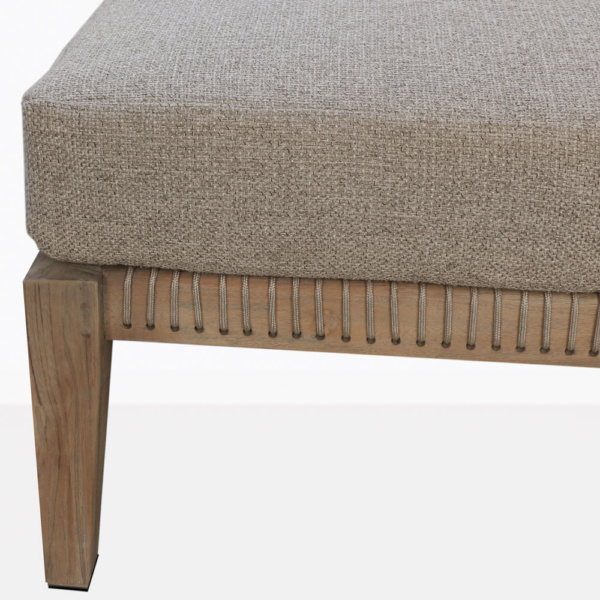 Our luxurious Gazzoni Ottoman has a stylish teak framework with a sophisticated rope design which holds your soft Sunbrella® cushion and keeps the strength and integrity of the unit in tact. 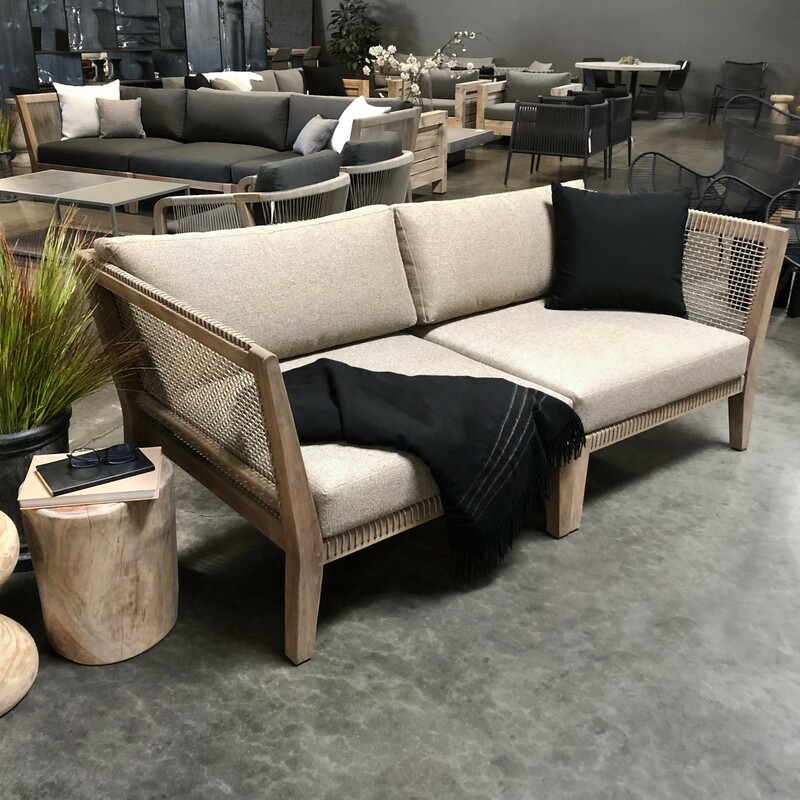 Like the many pieces of the Gazzoni Outdoor Collection, it can slide in and join on to the centre piece, as well as with benches, alongside the side table… the options are endless! Perhaps you’re ready to set up a luscious, luxurious outdoor relaxed setting. Find the best spot for maximising your time outside. A place with sun, free of wind… shelter your area with a fabulous cantilever umbrella, and set up the Gazzoni Centre and Corner Chairs in a shape that mirrors the architecture of your space. A couple of Gazzoni Teak Ottomans in the midst will provide you with premium comfort and a polished look that is inviting, chic, and attractive. This Gazzoni Ottoman is made out of first rate products which are tremendously robust in outdoor environments. From the rubber and oil coarsing through the teak, to the UV treated Sunbrella® fabric, the Gazzoni Outdoor Ottoman will look wonderful, feel fantastic and last for a long, luxurious time! It’s time for you to get involved with comfort, and to spend time in spaces that are chic and stylish. Call Design Warehouse today to order your Gazzoni Ottoman and other items from the incredible Gazzoni Collection. Design Warehouse is the leader in outdoor furniture. We have everything your need to offer up an outdoor living situation that suits your style, sensibilities and space! Whether you need dining, deep seating, shading or other, we guarantee we have something for everyone at Design Warehouse! Call us today to discuss the Gazzoni Corner Chair and other marvelous pieces in our range!